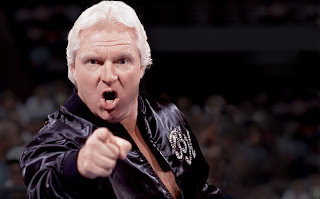 Just read that today is Bobby "the Brain" Heenan's 66th birthday, so I'm dedicating today's post to him. The Brain is without a doubt my favorite manager in the history of wrestling. Really I think he was the greatest manager of all time. I had the pleasure of meeting one of my childhood idols when I was reporting in Florence, Alabama. It was early 1998, and Heenan was an announcer with WCW. Or as the Brain would put it, he was a broadcast journalist. Thursday Night Thunder was going live from Huntsville, and being new in the media I thought I'd try my luck at getting credentials for the event. Up to that time, I had covered a few independent shows in the area, but this was my first shot at the big time. Much to my surprise, I was granted permission to come to the show and do interviews with some of the performers beforehand. My photographer and I trekked the 70 miles to Huntsville that afternoon wondering who would get to talk to. In our minds, we wanted Flair of course, but expected getting guys from the bottom of the card. I was shocked to learn that Bobby "the Brain" Heenan would be on the list of men I'd be interviewing. He was great too. There were several TV stations there, and the wrestlers would stop at each one and do a brief interview. The Brain was very nice and funny as hell, just like he is on TV. Even when our cameras weren't rolling he was making jokes. It truly made my night getting to meet him. I wish I could find that tape, it's somewhere in my collection. Once I find it, and figure out how to get VHS onto my iMac, I'll do that. I promise. In the 80's, Bobby Heenan was the perfect foil to the top faces in the WWF. He managed some of the all time greats, including Andre the Giant, Harley Race, Mr. Perfect, and "Ravishing" Rick Rude. He was even the "advisor" to Ric Flair when he jumped ship to the WWF in 1991. I'd love it when the Brain would get involved in a match and the good guy would go after him. I have countless memories of Heenan hurling himself over the top rope to avoid an unwanted assault. But more often than not, the Brain (or Weasel) would get caught and get his comeuppance. Ken Patera brutalized Heenan and left the Brain in a neck brace after a debate on WWF Superstars. Hulk Hogan kicked, punched, and atomic dropped Heenan more times than I care to remember. Big Bossman, Andre the Giant, and the British Bulldogs all used Heenan as a punching bag at some point. All that abuse took a toll on Heenan, and that's a big part of why he stepped from ringside to the announce table. He was great in that roll too. If you've got the 1992 Royal Rumble readily available (it's on the Ric Flair DVD) go back and listen to it. Heenan cracked me up with his emotion and constant support of Flair. I'll never forget him saying "It's not fair to Flair." And I've talked about this before, but Heenan was the one who introduced the World Wrestling Federation to Ric Flair by revealing the champ's gold belt on WWF Superstars back in the summer of '91. Heenan also introduced fans to the newly named "Narcissist" Lex Lugar at the 1993 Royal Rumble. The last several years have taken a toll on Bobby's health. He has battled throat cancer in the past, which affected his voice. Although, when I saw him at the 2006 Hall of Fame induction ceremony, he was still cracking jokes and getting everyone to laugh. Even as late as last year, he had some other health issues involving his jaw, but he seems to be doing better now. He was at a TNA event earlier this year. I also read earlier that in December, a two disc DVD set will be released on the Brain. I personally can't wait to add that to my collection, humanoids.